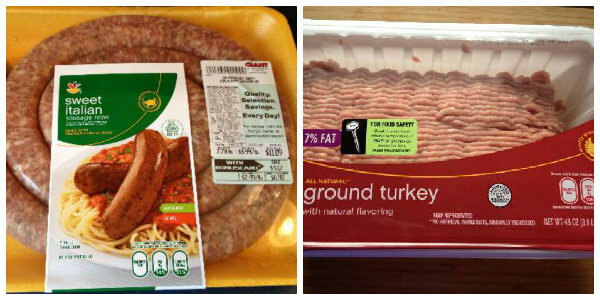 For years, I’ve been buying the larger packages (3+ pounds) of ground turkey and sausage, because the sale price per unit is so much better than the smaller packages. I would divide the raw meat into 1 pound portions and freeze individually. 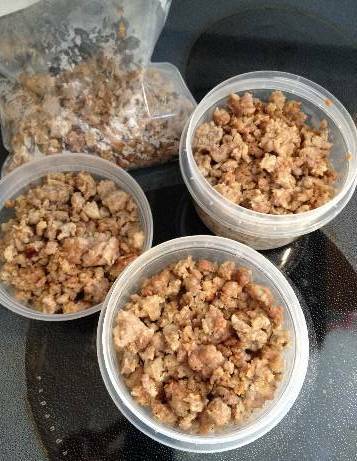 I’m not sure why it took me so long to figure out that browning ground meat and sausage in one big batch will save time in the future. I’ve changed my ways. Now, I’m still freezing in portions, but I’m browning the meat in one big batch first. This step is saving me so much time with meal prep. Lasagna, tacos, sloppy joes are all meals that I’ve recently made by using cooked meat from the freezer. 1. Heat your largest pan (I used my big dutch oven) over medium heat and add a couple of tablespoons of olive oil. Add the ground meat or sausage to the pan. 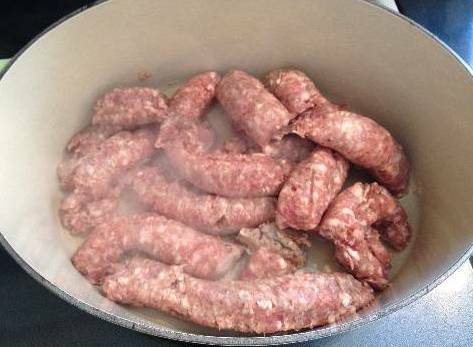 If cooking sausage, remove the casings before putting in the pan. If your package of meat is too large for the size of you pan, you’ll have to brown the meat in several batches. 2. Cook over medium-low heat and break up the sausage while cooking. Allow the sausage to brown a bit on the pan and then scrape the brown bits on the bottom of the pan to add flavor. 3. Once the meat is cooked through (no pink), you can drain any fat if you’d like and then allow to cool. 4. Divide up and store in freezer containers or bags. Stretch your dollar and store in 1 1/2 cup portions, but approximately, 2 cups of cooked meat will equal 1 pound of uncooked meat. Think about how you will use the meat that you just cooked. 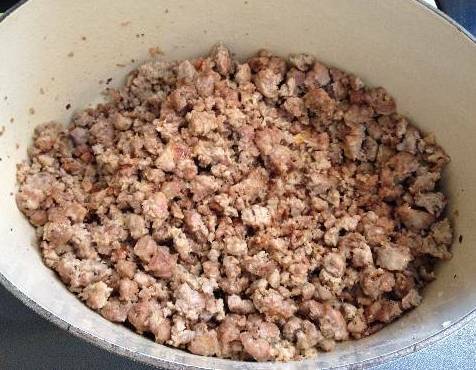 Personally, I divide bulk sausage into smaller 1 1/2 cup portions, because I know that I’ll likely use it in spaghetti sauce, pasta dishes, and egg casseroles where the meat is not the main star of the dish. While, I divide ground turkey into 2 cup portions, because I use that for tacos and sloppy joes where the meat is the main ingredient. I have also combined ground turkey and sausage, browned them and packed them in storage containers together. This gives the ground turkey some extra flavor. Do you buy meat in bulk and then cook it in one big batch? Let us know in the comments. I occasionally crock pot a turkey breast and save individual servings of diced turkey, but most of the time, my poultry solution is flash-frozen chicken tenders sold in a 10-pound bag, which enable me to grab from the bag and cook up however much I need. Thanks for sharing your revelation to cook the meat before freezing it. It did not even know this was possible. I would have been afraid it would give me food poisoning or something (not a crazy fear, as I have done that to myself at least once). So this is a great tip. Thanks! You shouldn’t have a problem with food poisoning as long as you cook the meat all the way through. I didn’t know you could do this! I thought meat had to be stored in the freezer uncooked. Thanks for stopping by, Khloe! I do this too! I buy my ground beef at Costco – only place I will buy it – and cook it up and freeze it in one pound batches in ziploc bags. Working full-time I find this to be a great time saver at dinner time! I always buy ground meat 5lbs at a time and I waste most of because I,only use abt a pound for tacos,which we dont eat that ofyen and taco soup which I also,only usr a pound for. I hadn’t even considered that yoy could brown the meat and freexe it and I thonk it’s best for me to know how I’m going to use all 5lbs before buying it.,I’m Jennice visiting from #SITSSHAREFEST and do visit me at mommyincolor.com. Thanks for stopping by, Jennice! Can I par boil link sausage,then freeze? And for how long? I’ve never done that, Tom. I don’t see why not though. Try googling it. I’ve been cooking ground beef & turkey together for some time now and will start adding bulk sausage next batch. I put about 1 1/2 cups in a plastic zip lock & freeze. 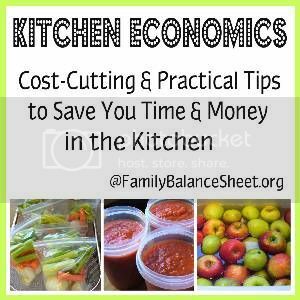 Great for just my husband & me and easy to make lots of dishes. If I need more, I take out an extra bag. I’ve also started roasting stew meat this way too & add carrots & potatoes then bag up and freeze. All this is great for no fuss camping. Don’t know why I didn’t do this 40 years ago. Love the idea for no fuss camping. We bought a camper last summer, so I need no fuss ideas! Thanks for reading and commenting.